I’ve noticed a difference between those who are extremely successful in their online business and those who just barely make it (maybe they’re full-time online but everything seems to be a struggle). The majority of those who are extremely successful become an expert at one or more elements of building their online business. For example, perhaps this person focuses time and attention on their copywriting. They become an absolute master as selling in print. They apply this skill daily to improve their conversions and make profits where others can’t. 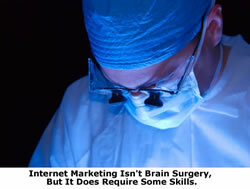 Another business owner focuses heavily on the PPC skills. They’re generating massive amounts of traffic at half the cost of all their competitors. A third person becomes an expert at content development. They’re shooting out a new product every week. And we’re not just talking about crappy products either. They develop good step-by-step systems for people to follow. You just can’t seem to keep up with their prolific content and product development. Each of these becomes an EXPERT at some element of their internet marketing. I’m sure we could sit around and debate which of these skills is most important, but they ALL can spell a very profitable internet business when you focus on them. That’s the key here. As I mentioned in my video last week, a mistake I made this year in my own business is trying to do too many different things. I’m cutting down my focus for 2009. Most beginners are much worse. They buy all the products about different subjects and try to become an expert in all of them at once. That’s a tough road to travel. Instead, focus your talents and skills on becoming an expert in one aspect…and then develop basic skills or outsource the rest. Online marketing is about selling. With all the discussion of free content and traffic, eventually something has to be sold. Focusing on this skill means studying the masters, copying out great letters by hand, and really testing different approaches to writing to find out what works for you. While you could sell your skills (and most do starting out) you can also use those skills to start building your own business. Prolific content creators have more products to sell, more content on their sites for SEO, and a better chance of coming up with that winning idea. For example you create one product the next year…but she creates 24. Who has a better chance of having a homerun winner. Obviously the person with more products does. In addition, you can use this skill to also generate traffic (for example you could start giving away some of your products freely to other marketers in your field to generate backend traffic from their sales). You’ve seen me recommend Glenn Livingston’s products and services very highly. He is an absolute master at researching markets to determine what they want…which can then be applied across the board to write copy that converts, create unique products that are exactly what people want, and put together follow-up information customers are searching for. Nothing surprises me anymore about what you can do with the right information. What about those PPC masters? You know the ones I’m talking about…they spent tens of thousands of dollars monthly on Adwords (in addition to MSN, Yahoo, and others) while turning it into a fortune. A lot of marketers online don’t want to do any paid advertising, but that’s just dumb business when every time you spend a $1 you get $2 back. I’d make that trade all day long. There are affiliates who simply use their PPC skills to promote one affiliate program after another bringing in six figure monthly checks. But they didn’t do it by simply “trying” Adwords. They became experts! Don’t want to spend any advertising money? Well you can then focus on search engine optimization. Get top positions for the right terms and make sales with or without your own products (build a list and sell affiliate products). Work with blogs, incoming links, etc. to become a free traffic generator for your own products and others. A lot of people don’t identify speaking skills with the internet, but look at how often we’re now using video. In addition, both teleseminars and webinars are ways to improve your conversion (you’ll often find it much easier to generate sales from that teleseminar instead of directly from the website). Plus, some of the best leads you could ever generate are offline leads that become customers (such as the ones you find from speaking engagements). What about those business owners who become experts at delegation and management of workers? I’m not talking about just outsourcing a couple of items. I’m talking about those who are good at managing people and getting the best results out of them. You can even find outsourcing companies who focus on this. You hire them and they get the projects done for you. Which skill is the right one for you? Notice that everyone of these skills is a marketable skill. They could and are being sold right now. There are copywriters, PPC services, seo services, professional voiceovers, etc. This leads us back to where I told you that everyone has to “Trade Time for Money” in one way or another when they’re starting out. Even if you never sold your skills for an hourly rate, you still have to develop them to a level where you could. And I didn’t even come close to covering all the online skills we could have in this section. Think about it for a while though on those you know who are most successful. They often develop mastery in at least one vital skill and sometimes in a 2nd or 3rd one. They don’t focus on doing everything at once. Which skill should you focus on? I don’t know. Part of it depends on your background skill sets and your own natural abilities. For example, I can tell you from working with many clients that those who do best at PPC are often the analytical types. They love numbers and seeing the results from making small little changes. While the more outgoing personal people often do better generating their traffic through joint ventures and providing content to others (such as doing webinars with affiliates). So I’m not telling you which skill for you to focus on, but I am telling you to focus on some sellable online skill in 2009. Which one will be your ticket to online success?